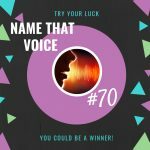 Delia invites you to guess the name of the voice you hear in Name That Voice! It could be someone recently in the news, a celebrity, even a cartoon character. The names of everyone who supplied the correct answer will be noted and Delia will periodically select someone to experience something with her…Are you game?